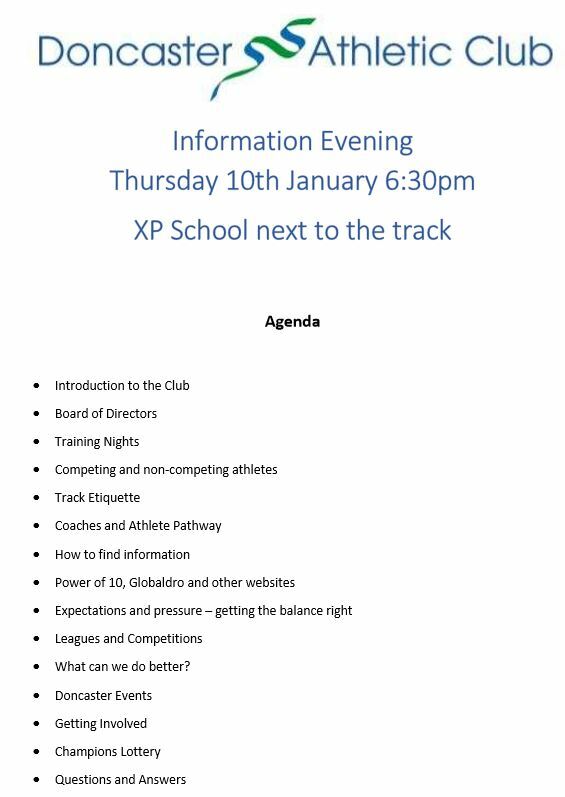 If you know anyone that wants to give running a go, we are the group to join. We have helped hundreds of people start running and this is a great way to make some (or lots) of new friends. 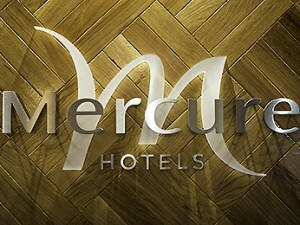 More details are available here. If you would like a number, please get one tuesday or thursday from the cabin for £8 – it would be great to see a few more taking part. No entries on the day this year. I have asked club secretaries to get any entries to me by Friday evening. 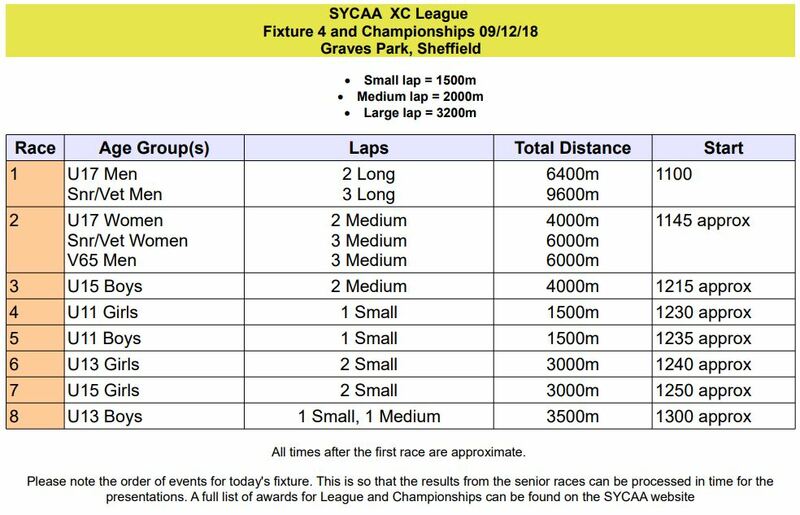 The event order starts at 11am with Senior/Vet Men, followed by Senior/Vet Ladies & MV65s. The start and finish as marked on the map may be swapped, depending on ground conditions. No parking on Hemsworth Road and immediate area. Cones will be out. Officials only in the pavilion car park please. Presentations in the pavilion as soon as we can manage it after the last race. Fingers crossed for good weather and reasonable conditions. See you all there. 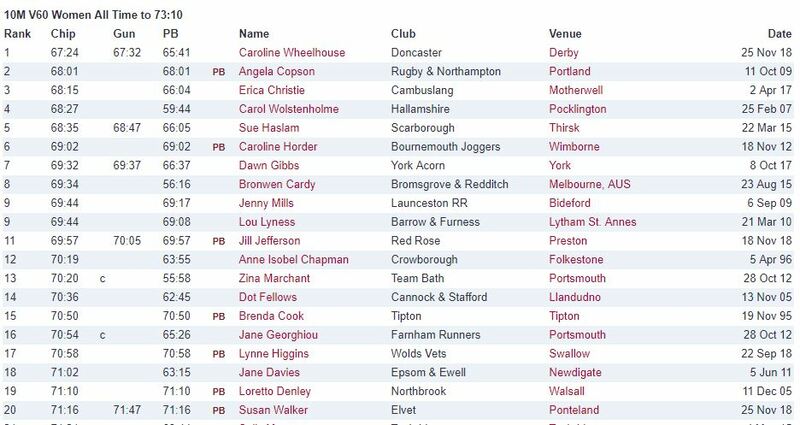 On 25 November Caroline Wheelhouse broke the 9 year old record by 37 seconds, finishing with a time of 67:24. Congratulations on an amazing run! “Records are there to be broken, but if this one lasts only one week it has meant the perfect end to a season that started so badly! After the bruises had faded from my London Marathon I had to start again to rebuild my season, which was a slow and patient process, but gradually things came together over the summer and culminated in the chance to run in an England XC vest. 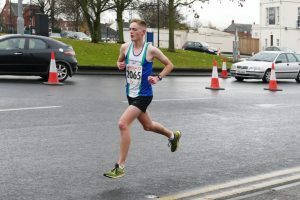 Whilst running the TCS Amsterdam Half in October my average pace meant that I had also run the UK all-time fastest F60 10 miles, so I decided to see if I could do it again in a 10 mile race! The Derby 10 is a good fast course – although I was a bit surprised when we turned a corner and found a long section of grass – and the weather was very cold, but okay. 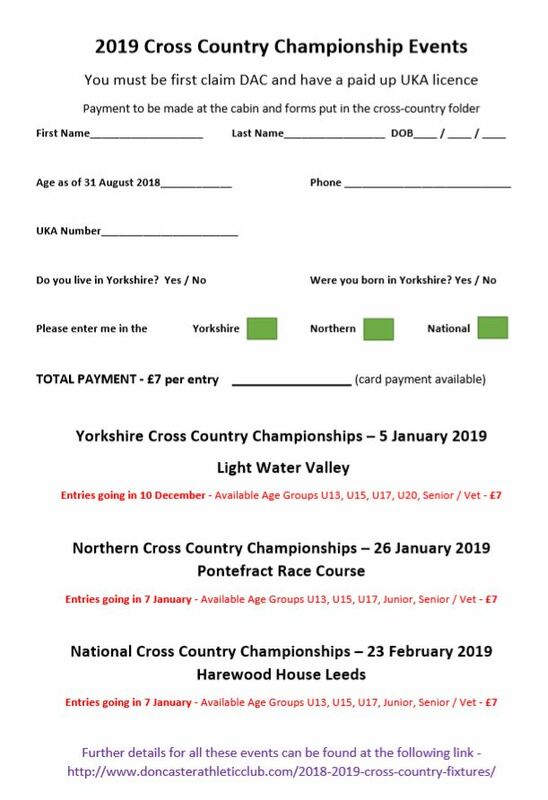 Please get your name in for the Yorkshire / Northern / National Cross Country Championships and the club will process your entries. The attached form is available at the cabin or click here to download it. Pass the form to Pam in the cabin with the entry fee of £7 for each race. This is your opportunity to race against the best in the region and the country! Deadlines on the form. 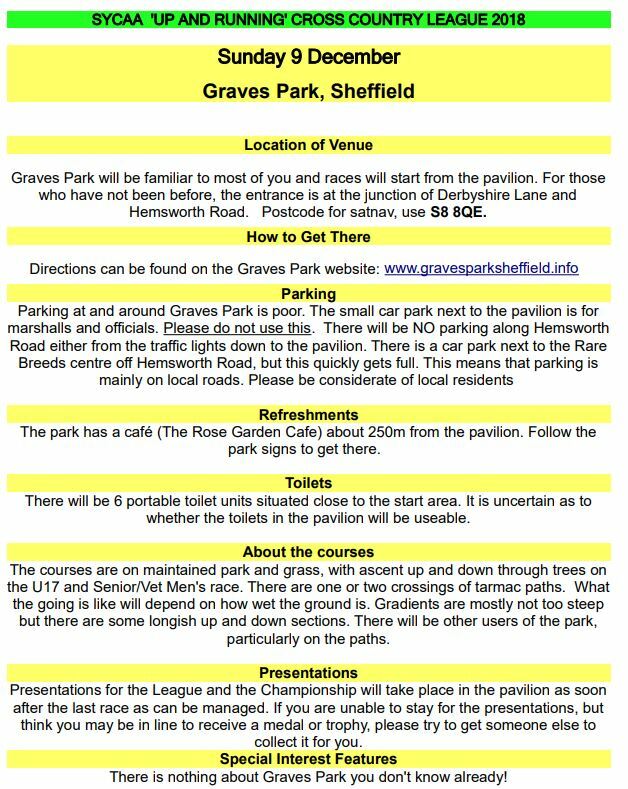 For the Notts XC Champs the entry details are here. Michael Richardson completed this half marathon on his birthday, 4 laps of the course finishing in 20th place with a time of 1:34:51.
finish. 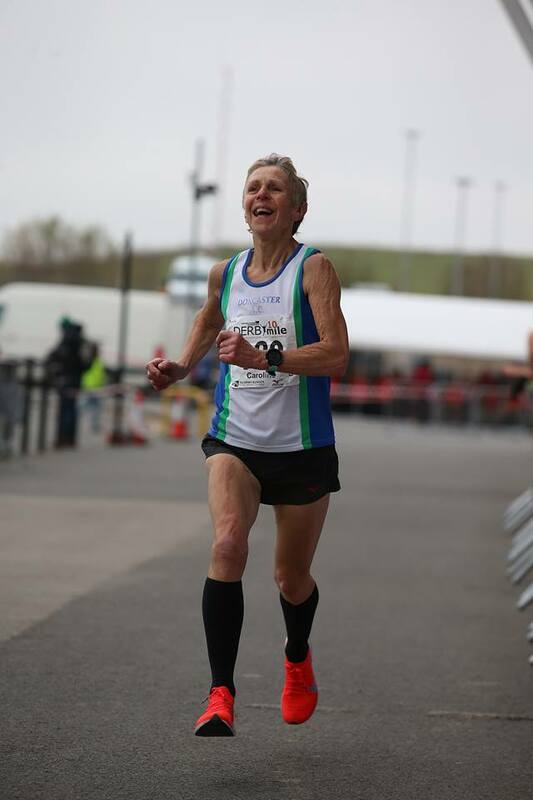 1st DAC lady to finish was Marie-Louise Taylor who ran her fastest 10k since 2015. 1st 3 in the various age groups were George Phillips, Connor Anderson, Kevin Newman, max joynes, Jack Pell, Margaret Butler, Sue Greaves. Dozens of our runners got PB’s and some got major benchmarks like 1st sub 40 or first sub hour. You can see from the range of times that we are a competitive and inclusive club, as club captain I am proud of you all. 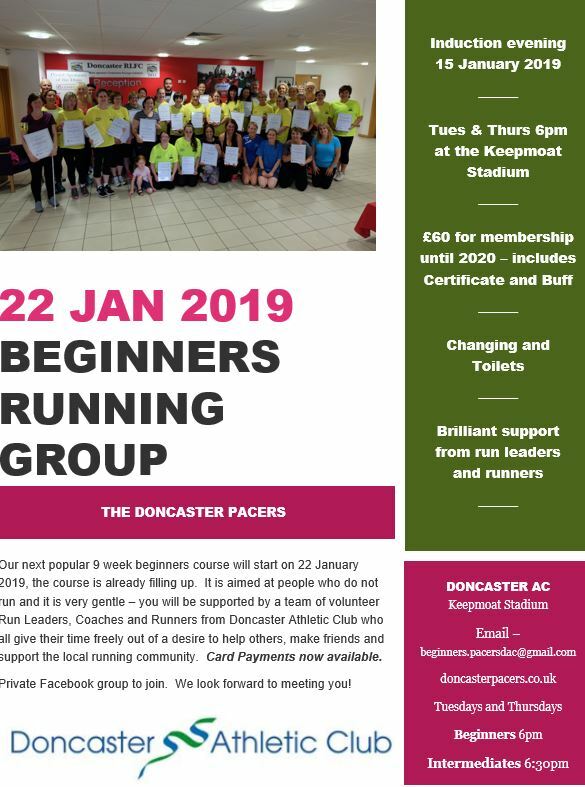 I know lots of the athletes who ran with the Pacers (from 40 minutes up to 65 minutes) achieved some amazing times with their help, they run with us every week so come and join them on our club nights along with the 85 runners who took part from DAC.